You recently reported a case of gastric dysmotility. Here is another case which I am currently re-evaluating. The patient is a 44 year old school teacher with asthma and severe reflux symptoms who was referred to me last year for what was initially felt to be a large hiatal hernia. Attempts at esophageal manometry were unsuccessful because the patient had a hyperactive gag reflex. They were unable to intubate her. The patient refused 24 pH monitoring. Video esophagogram showed a paraesophageal hernia. Esophageal motility was poor with poor emptying of the distal esophagus and tertiary contractions. She required urgent exploration for symptoms of nausea, vomiting and epigastric abdominal pain. A laparoscopic reduction of the paraesophageal hernia was performed. Because of the abnormal video esophagogram, a partial 180 Toupet posterior fundiplication was done. A percutaneous gastrostomy tube was also placed. Postoperative video esophagogram showed reflux in the supine position only. The patient initially did well with an improvement in her reflux symptoms. Her asthma was only slightly improved. Over the past year, the patient’s asthma has worsened again. She intermittently requires steroids. Her reflux symptoms are slightly worse. Her pulmonologist feels that her reflux disease is the major contributing factor. She has been Prevacid 30 mg QD and Propulsid 10 mg QID. Repeat video esophagogram showed worsening reflux in both upright, prone and supine positions with valsalva. There was no evidence of a slipped fundiplication or paraesophageal hernia recurrence. Esophageal motility appeared improved. The patient finally agreed to undergo 24 ph monitoring. She was difficult to intubate but this was accomplished. The study was very abnormal with reflux in all positions. DeMeester score was 168.3. Repeat attempt as esophageal manometry was successful. This revealed a slightly low lower esophageal sphincter pressure at 16.8 mmHg (average normal 24 mmHG) with normal relaxation during a swallow. No hiatal hernia was noted. There was a normal pattern of contractions in the distal esophagus. The patient has a slightly low contraction amplitude in the upper esophagus. The upper esophageal sphincter was normal. A radionuclotide gastric emptying study is delayed with the T1/2 being 155 minutes (normal is <45 minutes). Currently the patient is miserable with her reflux symptoms and asthma. I am contemplating doing a laparoscopic pyloroplasty possibly with a conversion of the Toupet to a complete Nissan. Does anyone have any other thoughts? 1) Probably the main disfunction in your patient is a slow gastric emptying, since she has almost normal esophageal motor function and a very slightly low lower esophageal sphincter pressure (16.8 mmHg). 2) Of course the respiratory symptons are worsened by reflux. 3) I didn’t understand why an “urgent exploration for symptoms of nausea, vomiting and epigastric abdominal pain”. 1) Since 180 Toupet fundoplication was abandoned for a long time ago (for bad results) and redeemed in the laparoscopic era, I think you should redo it and now perform a formal Nissen fundoplication (or at least a 270). 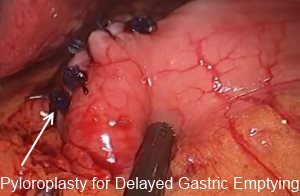 2) A simple pyloroplasty may add bile to the gastric reflux, thus worsenig any present or future esophagitis. I don’t think it’s a good idea. 3) Other solution, taht you can perform later if (1) was’t enough, is a complete gastro-duodenal diversion, with a truncal vagotomy, antrectomy and Roux-in-Y reconstruction. While undergoing a workup, the patient developed acute epigastric pain with severe nausea and vomiting requiring admission to the hospital. I thought that the patient had developed an acute gastric volvulus in association with her paraesophageal hernia. I did not do a contrast study to confirm a volvulus as I already knew that she had the paraesophageal hernia. On exploration I did not see a volvulus and the paraesophgeal hernia was freely reducible. I am concerned that a conversion to a formal Nissan alone with her poor gastric emptying may (using a term from Dr. Lee Swanstrom of Portland, Oregon) convert the patient into a gas bloat monster. Good point, on the other hand if I combine it with a conversion to Nissan, bile reflux may not be a problem. I have other thought: one must consider this patient as a full failure of laparoscopic treatment of reflux;so,I must forget the miniinvasive surgery and come back to the Queen of all the science:OPEN SURGERY and by this way perform a closure of the probable enlarged hiatus and a classical Nissen. But ,do not forgett that open surgery also have a high rate of failure in gross reflux in follow up of more 5 years.